We couldn't get Windows Live Writer Beta (WLW) to install properly on the first number of runs at it. Whether we were logged in as a domain admin, a user with local admin rights, or as a restricted user that had the install program elevated and the install would not finish. The initial error was: There was a problem downloading this product. Now, why would that be? In this case, we are trying to install the product onto a system that is on a SBS domain, with WSUS managing all updates. 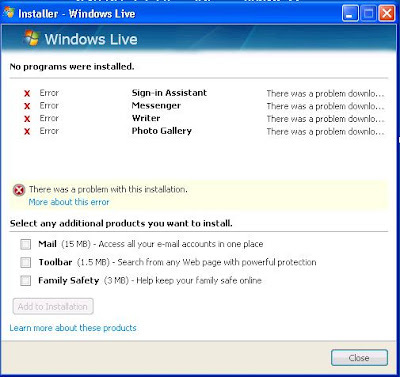 In our wisdom, we don't normally approve updates such as the Windows Live Betas. So, it seemed to us that this may be the source of our problem. We logged in to the SBS box, went into the WSUS 3.x MMC and approved the Beta updates required. We then reran the product install and the downloads proceeded normally and the install completed successfully. In the WLW Account properties we found that the provider was: Blogger (Legacy). So, the setup routine did not detect the new version of Blogger for some reason. Upon detecting the correct settings, we now have the correct Provider: Blogger. Given that this product is in Beta, here is one very important suggestion to the WLW team: Please give us signatures that can be tailored to each blogging account we use in WLW. Other than these hiccups to start out, this looks really neat! UPDATE: The picture did not publish properly when embedded via WLW for some reason. The links in the HTML code looked really different to any other embedded picture links in previous posts. WLW works pretty neat, but if pictures are going to be difficult, then it may not be used until they do embed properly. The image above was embedded again manually via the Blogger editor. > The picture did not publish properly when embedded via WLW for some reason. The links in the HTML code looked really different to any other embedded picture links in previous posts. Hi, I'm a developer on Windows Live Writer. If you could provide more details on this (such as how you inserted the image, and what the HTML looked like) it would be really helpful. My e-mail address is joe.cheng *AT* microsoft.com.